The self-proclaimed "Dream Team" of manga has left the publishing court. With an announcement posted on its Web site and subsequently reported on several anime and manga news sites in mid-March, Gutsoon Entertainment pulled the plug on its Raijin Comics monthly manga anthology, as well as graphic novels collecting individual titles from the anthology. "Based on our research with readers, retailers and distributors, we have come to a conclusion: Our publications, though appreciated by hard-core manga fans, are not penetrating a larger market. ... Raijin Comics Issue 46 and the June graphic novels will be the last issue you will be printing (sic)," read the announcement. And so, the magazine that proclaimed on the cover of its first issue that "THE DREAM TEAM HAS COME," while not dead yet, is definitely on life support. It's not for lack of trying that Raijin Comics failed. 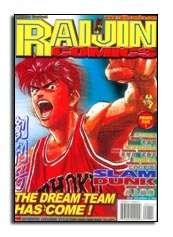 If anything, Raijin Comics may have been a victim of overambitious goals. The first issue debuted in December 2002 amid hopes that it would be the first successful weekly manga anthology to be published in America. "Raijin Comics is a great leap forward in manga publishing," an editor's note read in the first issue. "It's a magazine dedicated to bringing an authentic manga experience to the world." And then the next page laid out the price of bringing this experience to America: a cover price of $4.95 per issue and subscription rates ranging from three months for $59.40 to a one-year subscription of 48 issues for the priced-to-sell rate of $189.60. » "Slam Dunk," the tale of a high school student and loser in love who takes up basketball to woo a girl who already has her heart set on another player. » "Fist of the Blue Sky," a prequel to the bloody cult hit "Fist of the North Star," in which a master of the deadly fighting style Hokuto Shinken battles against the evil gangs of 1930s Shanghai. » "City Hunter," the story of a professional gun-for-hire who takes on cases that touch him from people who have nowhere else to turn. » "Bomber Girl," about a beautiful yet deadly bounty hunter who often gets so excited about busting the bad guys that she has a tendency to bust them into little bitty unidentifiable pieces -- not a good thing when one's trying to collect bounties. Unique? Certainly. 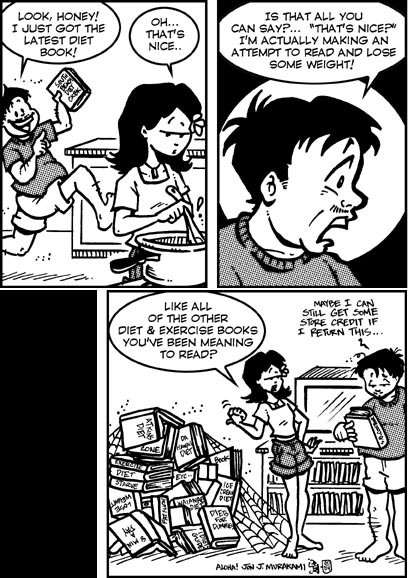 But unlike Shonen Jump, which already enjoyed a base audience off which its other, new-to-America titles could attract fans, Raijin Comics had nothing that would attract people to lock in long-term subscriptions ... or even short-term subscriptions, for that matter. Signs that the operation was in trouble began emerging last February, when Gutsoon announced it would be folding a 99-cent companion magazine that focused on the latest video game and anime news from Japan, Raijin Game & Anime, into the pages of Raijin Comics. A new "bite-size" four-week subscription was next unveiled in May. In June, Gutsoon announced that it was abandoning weekly publication, switching to a more conventional monthly publishing schedule as of the September issue, and raising the cover price by a dollar. New titles were rotated in and out, to the point where the April 2004 issue boasts 10 different series. Apparently, nothing helped. Perhaps the early prospect of paying $20 a month to keep track of 10 to 12 different series was too much for even big-spending manga fans to bear. Perhaps readers had trouble embracing some of the more unique stories seen on this side of the Pacific in a while, like the problems an elected president of Japan might face ("First President of Japan") or a comedian being thrust into a battle against a terrorist organization with 9/11 overtones ("Revenge of Mouflon"). Whatever the reason, readers who supported the Raijin concept soon will be left in the lurch, with no real alternative to reading their favorite stories other than hunting down the untranslated Japanese source material.